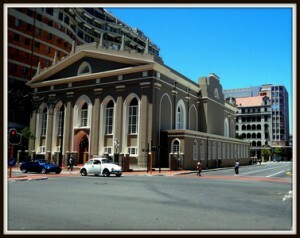 Corner of Adderley Street & Bureau Street. There is probably no building in South Africa that is better known than the Groote Kerk. Jan van Riebeeck brought the Reformed religion to the Cape and the practice of this religion played an important part in the lives of the pioneer community. From the beginning of the settlement, Van Riebeeck’s ship, the Drommedaris, served as the first church on our shores. The first Sunday service at the Cape was held on board on 14th April 1652. After settlers landed, provision was made in the complex of buildings opposite the entrance of the Fort de Goede Hoop, for a hall in which religious services were held. The hall soon became too small as the population expanded, so, when work on the Castle was begun in 1666, one of the timber sheds in the inner court yard was converted into a church by giving it a stone floor and a front gable. Since 1666 burials had taken place inside the inner courtyard of the Castle, but the space taken up by the graveyard was now required for other purposes and the removal of the graveyard to some other place had become urgent. On 16th December 1677, Commander Johan Bax and his Council set aside a suitable area in the Company’s garden as a burial ground. This was the land on which the Groote Kerk now stands. Commander Bax and members of the Public Council laid the foundations of a cruciform church on this site during the following year but almost a quarter of a century was to pass before the “proper church ” was built. In 1685 the well-known commissioner Hendrik Adriaan van Rheede gave instructions that a cross-wall or “kat” be built across the court of the Castle, and that provision be made in it for a new residence for the Governor and several halls. 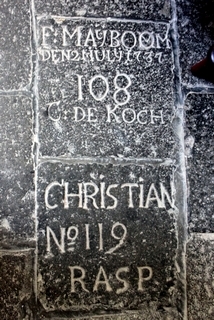 This “kat” was only completed in 1695, whereupon the Church was moved to one of the halls. On the day of Pentecost, 22nd May 1695, the first sermon was preached there. In 1699 plans for the new church were drawn up and a contract was concluded for the building. 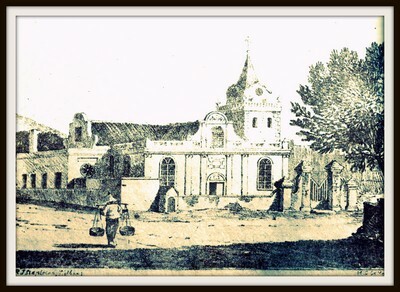 The foundations laid by Johan Bax were pulled up, and on 28th December 1700, Governor Willem Adriaan van der Stel and several of his councillors laid the first stones of the new church. The new church had neither an organ nor a vestry. 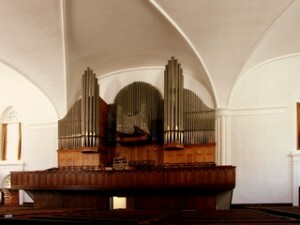 In 1737 the church bought its first organ from Governor Jan de la Fontaine, but about 1853 it broke down and had to be replaced. A vestry was added in 1744/45. 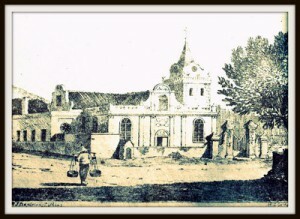 While the church was being built, the graveyard, (Church Square today) which had become “a scandalous spectacle”, was restored and Abraham Hartog contracted to build a wall round it. Inside the church provision was made for about 180 numbered vaults and some unnumbered graves. There were six graves on either side of the pulpit, and in front of it the vaults were apparently arranged in rows, fifteen in a row, up to the organ. Some of the vaults could hold, from six to nine cadavers. The vaults could be purchased or hired, and nearly all people of standing of those times were buried here. Among those laid to rest here were the following governors: Simon van der Stel (1712), Louis van Assenburgh (1712), M. P. de Chavonnes (1714), Adriaan van Kervel (1737), Ryk Tulbagh (1771) and Pieter Baron van Rheede van Oudtshoorn (1773). By the middle of the eighteenth century the church had once again become too small for the growing congregation. The Kerkraad (Church Council) first tried to gain space by building two galleries above the doors and moving the pulpit back, but when restoration work became necessary in 1779, the opportunity was taken to enlarge the church by building out the four corners. In this way the building took the form of a rectangle, but the pitched roof retained its cruciform shape. In 1779 the remarkable Anton Anreith pulpit replaced the old pulpit, which still graces the church today. The flat roofs of the extended corners of the church constantly leaked and required costly maintenance. The condition of other parts of the building also gave cause for concern, so the Kerkraad had it investigated in 1835 by the experienced builder, Hermann Schutte, and the master carpenter, L. F. Anhuyser. They recommended that the roof be replaced, but also drew attention to moisture in the foundations, mainly due to the water that collected in the vaults. 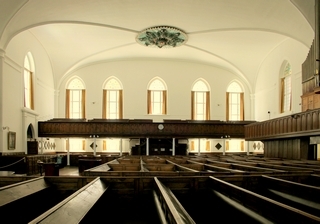 The Church Council, wishing to avoid the high costs involved, merely propped up the roof from the inside, but this only increased the congregation’s fear that an accident might occur. Once again Schutte and Anhuyser, together with other building contractors, inspected the building. Their reports gave rise to the opinion that it would be best to demolish the building and build a new one, so at the end of August 1835 the church was vacated and services were held in the Lutheran Church in Strand Street. 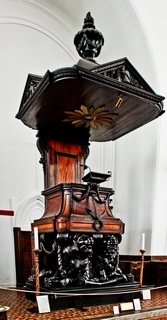 Before the work began, the beautiful pulpit was protected from damage by building walls round it where it stood. When the roof was removed, Schutte found that the foundations could not bear the weight of the higher walls and new roof. There was no alternative but to demolish the entire building excepting the steeple and the vestry. When this was done, the vaults were filled in and many of the gravestones were lost. The style of the building was a peculiar combination of Greek and Gothic traditions. 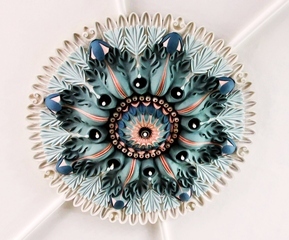 Schutte’s greatest achievement was the fine stucco ceiling with its impressive vault. The inauguration of the building took place on 31st January 1841. Hardly any alterations have been made to it during the past century and a quarter, except that the buildings on either side of the church have disappeared. 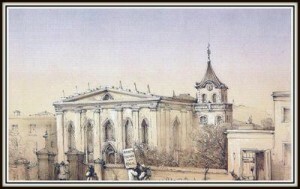 The old sexton’s house which stood facing the former Heerengracht and partly in front of the church, at first a simple little house, was enlarged to become one of the finest old Cape buildings, but was eventually demolished to widen Adderley Street. The vestry in Bureau Street was enlarged by giving it a second storey but disappeared when Bureau Street was widened. On the opposite side of the church the large Groote Kerk Building was erected in 1941.